DASA Courseware Partners develop professional courseware aligned with DASA Syllabi. 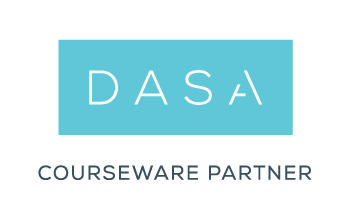 Once developed, and approved, Courseware Partners offer their courseware to Training Partners along with Exam vouchers that the Courseware Partner purchases from DASA. Courseware needs to cover all the learning objectives provided by DASA in the syllabus. Basically this means that the courseware needs to be quality, and instructionally solid. Courseware Partners have to make sure that trainers can effectively use the materials. This means there need to be notes, an instructor manual, and a Train the Trainer offered to trainers. DASA will review all courses before they are being published to the market. Sometimes courses are not approved immediately as they do not align fully with the requirements of DASA. DASA works with independent reviewers to review the courseware, and the objective is always to provide constructive feedback and support Courseware Partners in building great courses. In line with DASA’s mantra – DASA is an open model, and everyone can become a DASA Courseware Partner. The annual fee for Courseware Partners is $5000, does this include all courses? The courseware fee is based on 2 courseware reviews per year. If more reviews are required, reviews will be charged on a cost-basis. Can Training Providers just offer exams to the market? This is recommended, but not mandatory. It may be that a customer is not looking for certification, but only interested in training and therefore does not want to buy exams. in case these learners come back later and want to still take their exam, the Training Partner can purchase the exam voucher. Is it mandatory for Courseware Partners to sell exams together with courseware?